The days are still hot but we are starting to get that occassional cool down that signals summer is coming to an end. Pumpkins are growing in my yard, school supplies are on the shelves (and Chirstmas trees too, what?!) and the last session of swim lessons is already underway. School starts in just over a week in Fort Collins and 2 weeks in Loveland! I’ve teamed up with Kayla Goode this year to bring you super cute back to school stylized sessions. Skip the 2 minute mugshot from school and opt for a great portrait that will show off your child’s personality and capture them as they are at the begining of the school year. Can you imagine how much they’ll grow, learn, and change before school lets out again? 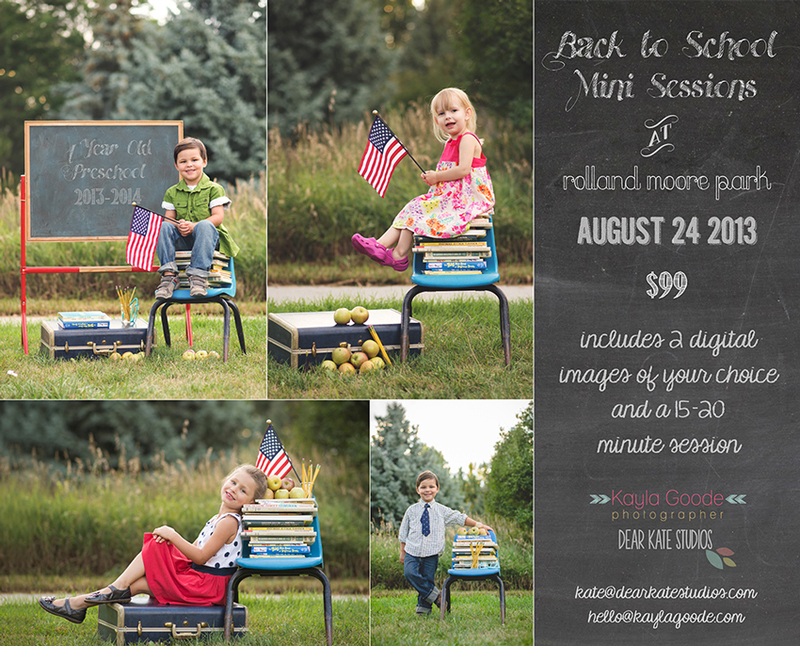 Back to school mini sessions will take place August 24 at Rolland Moore Park in Fort Collins. Email kate@dearkatestudios.com or hello@kaylagoode.com to reserve one of these very limited sessions!